Parental Mental Health - Child & Family Connections, Inc.
At least two to three million children in America have parents with self-reported psychiatric disabilities. Of the 1 in 17 Americans with a severe psychiatric disability, approximately 65% are mothers and 52% are fathers. These parents face the same challenges as other parents—child care, education, finances, work, the household, and more—often while experiencing periods of severe depression, mania, and/or psychotic episodes that can result in hospitalization, suicide, and sometimes death. We know how to support these families—we know what works—but treatment options for parental mental illness (PMI) are virtually nonexistent. Most treatment planning fails to acknowledge or integrate a parents’ critical role as caregiver, provider, and protector of their children and families, and only do so when families are already involved in welfare systems. That’s far too late, and the stakes could hardly be higher. The children of these families are especially vulnerable. 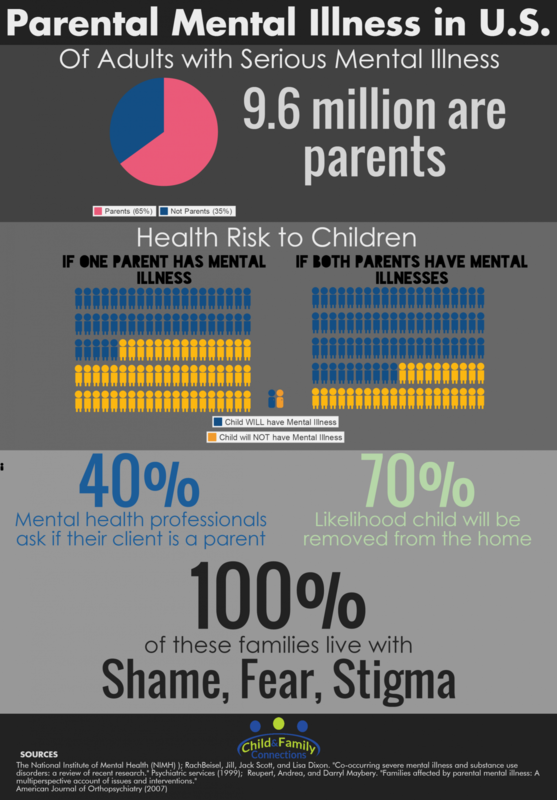 When one parent has a mental illness, the children have a 30% to 50% greater chance of developing their own mental health challenge; when both parents have mental illnesses, the risk to the children increases to 50% to 70%. Even among so-called “healthy” children, the effects of PMI may be less obvious, but they are no less insidious. Bullying, being bullied, drug use, poor grades, promiscuity, and truancy are common outcomes for these children. The psychological scars run deep and the effects last long into adulthood. Children live in fear of a parent’s relapse, creating chaos and instability, as well as role reversal (parentification) and hypervigilance, stealing the precious years of children’s innocence. As bad as that is, there’s worse: the all too frequent pain of separation. Children of families with PMI are far more likely than the general population to have contact with child welfare services and are at far greater risk of having children removed from the home by welfare services. Custody loss rates can be as high as 70 to 80%. In fact, only one-third of children of families with PMI are being raised by that parent. The distinct probability of losing their children prevents many families to accept much-needed services. And so, they suffer in secret. Society pays a price, too. Serious mental illness costs the United States $317 billion per year, according to a recent estimate. In addition to the human suffering psychiatric disorders cause, they are among the most expensive of all health problems, accounting for $193 billion in lost earnings and $171 billion in lost economic output. Although there are many parenting programs in the community, they typically fail to address the specific needs of families with PMI. Human and health agency workers do not have the skills and knowledge to identify, refer or intervene appropriately, and do not have the training and knowledge to work effectively with these families. Agencies that work with families affected by PMI tend to have a singular and often negative focus when defining their client base. A survey of programs across North America found that systems are fragmented and uncoordinated with gaps in organization and administration. So while emotional and social supports, like the programs sponsored by CFC, are particularly important for parents with a mental illness, addressing the needs of families with PMI requires a fundamental change in the way most health and human service systems operate. Research from Harvard University has proven that supports, like CFC’s workshops, can help parents be more effective and more confident and contribute to the well-being and resiliency of their children. Services that help families strengthen family bonds by improving family interactions and increasing social supports are essential to mitigate risk and enhance healthy relationships between parents and their children. For every dollar invested in prevention and early treatment programs, between two and ten dollars could be saved in health costs, criminal and juvenile justice costs, educational costs, and lost productivity. In short: Prevention is effective.